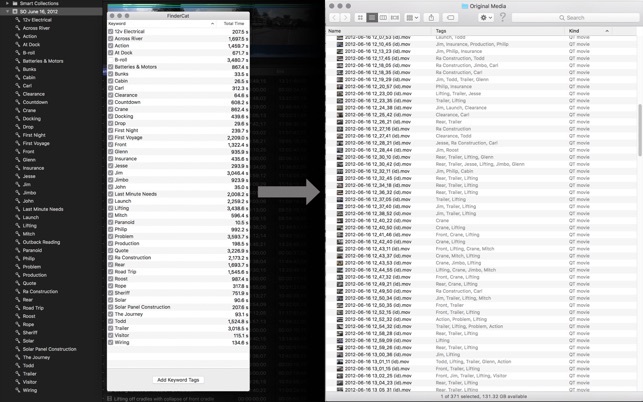 OS X Mavericks (10.9) introduced Finder tags, which are like colored file labels on steroids. When importing files into Final Cut Pro X you can create a keyword for each Finder tag on the files you are importing. Wouldn’t it be great to go the other way, and turn your organized keywords in Final Cut Pro X into a catalog of tags? That’s what FindrCat does! 2. Select an Event of clips (with no “files missing” warnings), then drag to the dock and drop onto the FinderCat icon. 3. Use the checkboxes to choose the keywords you want to become Finder tags and click Add Keyword Tags. You’ll get an alert from FindrCat telling you how many keyword tags were added. And now you have keyword tags on your media files with almost no effort. This also embeds metadata into the files that can be restored later by FindrCat (Pro). • Open a Finder window and show the Tags area in the sidebar. Click the All Tags… at the bottom and a column shows you all your tags. Select a tag to see every media file tagged with this keyword. • In Finder choose File > Find (Command-F) and start typing a keyword name into the search box and you’ll be given the option to see all files with that tag. • To see which tags are on your media files, open a Finder window and choose View > as List (Command-2). Control-click on a list header and choose Tags from the contextual menu to add a column showing the tags on your files. Important: Spotlight does not index files stored inside a Library bundle, so searching for tags will only work with external media. Spotlight will not index folders or volumes that have been excluded in Spotlight’s Privacy pane. To import your files back to Final Cut Pro X, select the media files resulting from your search or filtering in Finder and drag them to the Final Cut Pro X icon. The files will be imported to the currently selected Event. To import the Finder Tags as Keywords, be sure to turn on the checkbox to make keywords From Finder tags. Instant keyword organization in Final Cut Pro X! • Metadata exported in the chosen Metadata View. 1. In FindrCat or FindrCat (Pro) version 1.1 or later, follow the instructions above. This embeds metadata into the files that can be restored later by FindrCat (Pro). Tip: Choose a metadata view from the pop-up menu in the Inspector. Unless you have a specific set of metadata you want to use, we recommend Extended. 2. In Finder, search for or filter your tagged clips using the instructions above. 3. Drag the clips you want to import to the dock and drop onto the FindrCat icon. FindrCat (Pro) will import the clips into the Final Cut Pro X Library you choose, and will restore your clips with Roles, Notes, Markers, Keywords, ratings, video adjustments, audio adjustments and metadata that were previously added to the clips using either FindrCat or FindrCat (Pro). i have tons of Concerts clips, a lot of bands peoples feelings and all taged with Keywords on FCPX for every project, Findrcat allow me use the finder better for look my files faster and all togethers if i need to have theyrs again or if have to share with any other people or editor. Where where you all my life! This tool as been hugely helpful! As you all may know, sadly, FCPX does NOT write metadata directly to media files. So all of the time spent logging and tagging media is basically relegated to your library database - not good if the two are ever separated. This finally frees up that information to be used across (Mac) systems, which is HUGE! No need for an expensive MAM, just make sure to develop a tag/keyword nomenclature that is consistent and you will be in great shape. At my company we capture and ingest large amounts of media that is reused across mutliple projects, and as we add new editors and social media staff, we need a searchable way to find media that people will understand. FindrCat has solved this problem for us with EASE and SIMPLICITY. The LAST thing I wanted to do was spend a bunch of time and money buying and learning a complicated new MAM program. Thanks to this, I don’t have to. Those who log clips in FCPX with Keywords and Notes know how it rewards you when you need to find the perfect shot quickly. FinderCat extends the reward to the macOS Finder by allowing the user to search for their Keywords at the Finder level. Spotlight search is Google Search like fast and now all clips on your connected drives can be search instantly thanks to FinderCat! This is more powerful than just renaming clips at the macOS Finder (which can be very powerful). This allows you to find clips in many different ways! Imagine handing a drive to someone who doesn’t know how to use FCPX or iMovie…they can just use Spotlight search to find and organize clips into folder with macOS Finder. This is a big deal for me and I already find this tool to be extremely valuable.